Sick of talking about the weather, courses and your holiday? 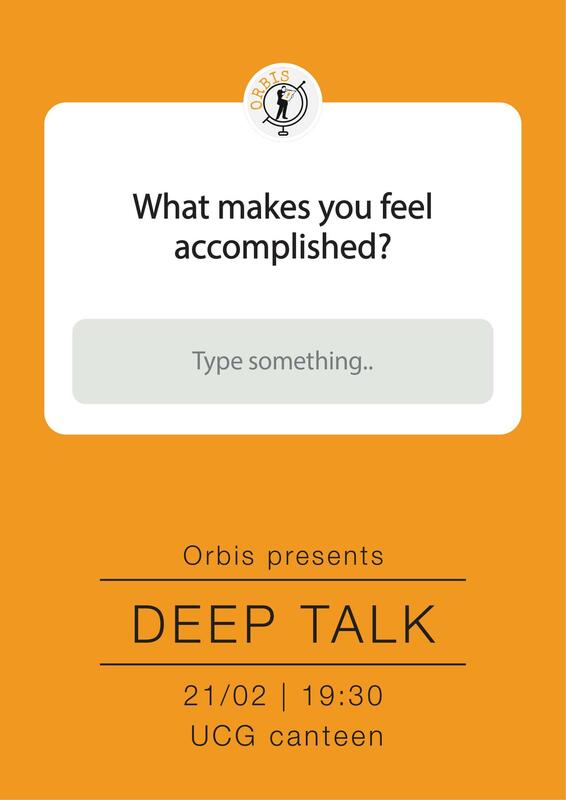 Skip the small talk, and get straight to the good stuff: deep talk. On the 21st of February, Orbis gives you the chance to find out all those things you’ve always wanted to know about somebody. Do they believe in aliens? What is their greatest ambition? What was the best day of their life? In a speed date type setup, you’ll be able to find out the answers to all of these questions, and many more. It will be a unique evening, giving you the chance to meet new people, and connect in a very different way. Skip the small talk. Deep Talk. 21st of February, 7.30pm, UCG canteen. Snacks and drinks will be available to buy. To make the event as good as possible there is a set limit of participants. So sign up on the Caerus website, and do it fast!